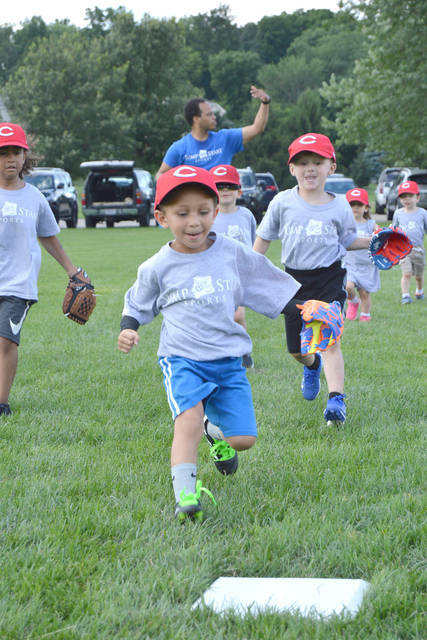 The entire Gray team from the Jump Start Beavercreek T-Bird T-Ball League learns to run the bases, June 27 at Rotary Park. 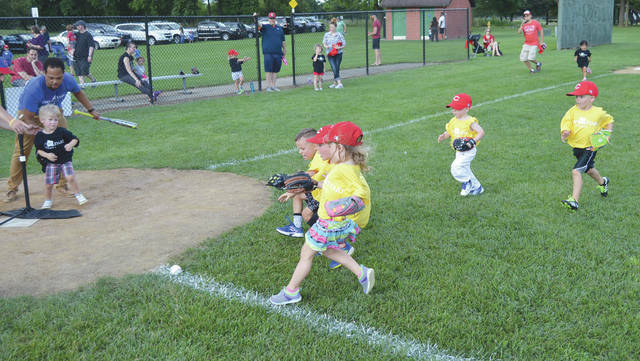 Despite the Jump Start instructors’ encouragement, a T-Ball batter remains hesitant to run to first as the entire yellow team infield charges the ball down the first-base line, during the third week of practice, June 26 at Rotary Park in Beavercreek. 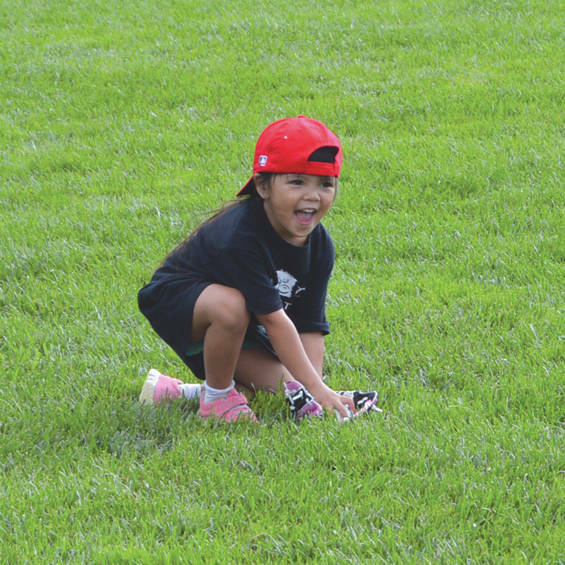 A young Beavercreek T-Bird T-Ball league shortstop reacts with surprise as she makes a good fundamental stop of a ground ball that rolled to her, June 26 at Beavercreek’s Rotary Park. Keeping her eyes on the ball, a Jump Start T-Ball batter takes a solid swing during the group’s third week of practice, June 26 at Rotary Park in Beavercreek. BEAVERCREEK — Moments after jogging the gray-shirted Beavercreek T-Bird T-Ball team to first base, the Jump Start instructor asked the players to tell him what base they were standing on. “First base!” the kids cheered in unison. “That’s right. Good job!” the instructor said. He then jogged the dozen or so 3-4 year-olds over to second base and asked them to tell him what base they were standing on now. “First base!” they said in unison, just as excitedly as when they actually were on first base. Such is life as a Jump Start instructor when you’re giving nearly 50 or so excited youngsters their first experiences on a baseball diamond. The Jump Start program offers instruction on the basic fundamentals of sports like T-Ball baseball, basketball, football and soccer. Wednesday’s roughly one-hour session provided each child enough time to participate at three different baseball-related stations: One section of the Rotary Park field was utilized to teach the kids how to run the bases; another had a line of batting tees set up for the kids to learn how to properly hold and swing the bat; and the final station offered kids the chance to learn how to fundamentally catch a ground ball that was gently tossed their way. 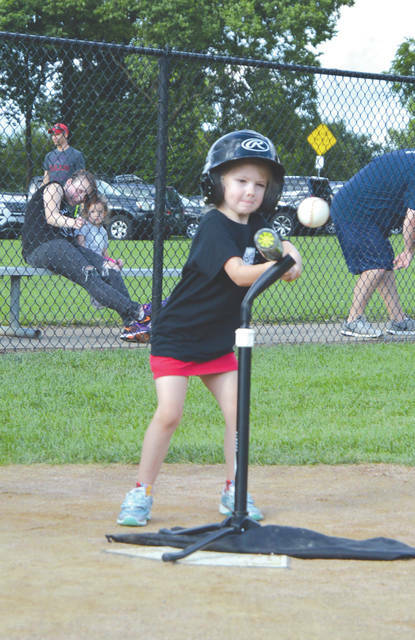 Finally, with several parents standing at their child’s side, the four teams each got a turn at batting and fielding in a pair of simulated T-Ball games. Two Central State University students — Darius Ford and Rykki Tate — were among those who were on hand as T-Ball instructors. Tate is a recent CSU grad in Physical Education and Recreation. Ford is a senior-to-be Business Major with aspirations to get into the sports field eventually. Ford, of Columbus, was working with the young fielders at one point, then helped a few of the batters during the simulated game. Asked to describe a fun moment in instructing the kids, Ford broke into a smile. “Honestly, just watching the kids have fun giving it their all, to see them come out here and learn, and get better at what they’re doing, they’re going to be the best that they can be, because they’re out here having fun and learning the fundamentals,” he said. Co-program director Seth Kriesberg, of Troy, enjoyed the three-week instructional program at Beavercreek’s Rotary Park. He said the kids appeared to enjoy it, too. “The kids are picking it up extremely well. They’re getting what we are teaching them, and they are demonstrating it on the field. They’re doing a tremendous job cognitively understanding what they need to do. They’re understanding how to run the bases, they’re understanding how to hit the ball, how to step when they’re hitting the ball … all the fundamentals, they’ve shown that they’re learning it. “My best moment is just seeing the smiles on these kids’ faces. Just seeing them come out to play ball, and seeing them here having fun, and then leaving with big smiles on their faces, that’s what makes this all worthwhile to me,” he said. Jump Start Sports offers youth sports programs in Ohio, Michigan, Pennsylvania, North Carolina, New Jersey, Georgia and California. They have 11 youth sports programs in the Cincinnati/Dayton area, including Beavercreek, Bellbrook and Fairborn. For information about future Jump Start programs, please visit jumpstartsports.com.